An interview with Vyacheslav Belokrenitsky, Deputy Director at the Institute for Oriental Studies at the Russian Academy of Sciences. The basic question is, of course, about the visit of Mr. Zardari to Russia. What was the major objective of this visit? The major objective of the visit is to discuss bilateral relations between Russia and Pakistan. The last visit of the first person of this ruling hierarchy of Pakistan was the visit of President Pervez Musharraf in February 2003, so, many years have passed since this visit, but, of course, we can underline the issues of this meeting of President Medvedev and President Zardari as they met each other at the multilevel conferences held in Yekaterinburg, in Sochi; last time they met in August 2010 in Sochi where both presidents participated in the meeting with the President of Afghanistan; therefore, the relationship between the two countries are developing rather fast, recently there seemed to be a real breakthrough in relations with Pakistan due to certain circumstances and courses. I would say that there is Russia’s growing concern about the situation in Afghanistan and in Pakistan, just as the situation in Afghanistan is very like to Pakistan situation, in general the geopolitical situation in the region is really in the focus of Moscow’s attention, and this is why Moscow pays so much attention to the relations with Pakistan these days. One of the major issues that will be discussed is the situation in Afghanistan in two aspects: Afghanistan situation is a great concern for Russia because of the drug problem and of the Islamic radical movement which is also disturbing. So, this is one aspect of the relationship that we shall underline. Then, of course, some bilateral relations where exists potential of developing economic relations, of growing trade relations and economic cooperation between the two countries. Among these problems, that can be solved in the course of developing bilateral relations, we can mention the cooperation in the energy sector, in agricultural sector and even a very long-standing question of expanding the Pakistani steel mill that was built by the USSR in the 70s-80s, - it also may come up in the talks between the two presidents. And in general the trade level is still very modest for the two countries which are quite big and have good potential: the last year trade figures are less than $400 million, so there is a potential of growth in the trade field. Once again I would stress the importance of the regional cooperation; Russia is interested in promoting this regional cooperation between the Central Asian countries, first of all, between Tajikistan, Afghanistan, Pakistan, and there were several meetings of these four countries, there is bilateral format of relationship and there is multilateral format of relationship between them, and now the importance of the strategic relationship is growing. The issue of Afghanistan in the context of future development is a great concern in Moscow; what comes after the United States would probably leave the country by 2014 or later, then what will be the situation in the region, how it will affect the drug problem, the Islamist terrorist problem - this is a great concern for the security of Central Asia, and as Russia considers Central Asia as a territory of its great concern, therefore, Russia takes interest in what would come next. The presidents of two countries will probably discuss the issues of whether and when the United States and the coalition that is now there in Afghanistan, whether they effective in the country and on what terms, with what consequences, and this is also quite an important issue to discuss. And, of course, then the bilateral relations will come into the focus. I was actually thinking that Mr. Zardari’s visit is coming in a very sensitive moment for Pakistan, judging the assassination of Osama bin Laden. So, what could be the repercussions of this action – both for Pakistani establishment, just how consolidated is the establishment on this issue, and for Pakistan relations with the United States and with China? So, could you expand a little bit on that? This visit is one of the first foreign visits of the President of Pakistan after bin Laden’s assassination on 2 May. His visit to Russia was planned before, and the official announcement about his going to Moscow for a four-day visit was made in Pakistan on 30 April, two days before the assassination. Therefore, these events are not interconnected, but Russia sticks to its plans of inviting the President of Pakistan. 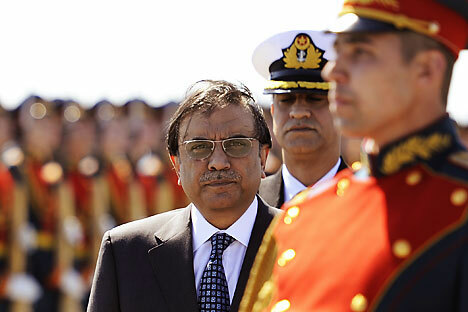 It is important for Pakistan, it is a kind of exit in the context of very strange relationship between Islamabad and Washington, in this context we can see the visit of President Zardari and then the announced visit of Prime Minister Gillani who is going to Beijing on 17 May, for a four-day visit too. For Pakistan this moment is very important because the relationship between the military and intelligence services of two countries is very strange, and Pakistan is searching for a counter play at this moment, therefore, it is very important for Pakistan. For Russia too, it just has an independent position; of course, Russia welcomes the struggle against terrorism and bin Laden’s assassination, which is a welcomed development if and when the effect of this assassination would be detrimental to the terrorist movement throughout the world and in this region particularly. Therefore, Russia supports this struggle against terrorism, but at the same time it does not want to put Pakistan in a very difficult situation. As for Pakistan internal situation, I would mention that the military has lost its face in this operation, and I think that the civil authorities, which are represented by the President and by the Prime Minister, now strengthen their position, and it is possible to forecast that this kind of civil government would stay and continue to function in Pakistan.